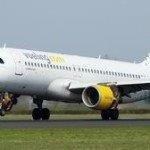 Vueling Valentine promotion: Buy ticket for 3 travelers and pay for 2! Cheap return flights from Europe to South Korea or Japan from €308! Cheap return flights from the UK to Miami, Florida from £288! Spanish low cost carrier Vueling has just released their Valentine promotion offering 33% discount when booking your next flight for 3 travelers. (So basically you pay for 2 but only works when your booking is for three passengers. There is special discount code you neet to apply during booking process. Simply follow below conditions of this Vueling promotion. For instance you can book return flight from London to Barcelona already for £32.50 per person. (Incl. all taxes and fees). This Vueling promo code is valid only for return flights in the lowest tariff Basic Fare. This Vueling Valentine promotion is available till 18th of February for travel between 3rd of April and 30th of June 2018. (Except blackout period, simply follow below link to check compete conditions of this promotion.). Booking sample of Vueling Valentine promotion: Buy ticket for 3 travelers and pay for 2! In this case you would fly from London Gatwick to Barcelona on 7th of May and return from Spain back to the United Kingdom on 10th of May. You will pay total €110.51 for 3 pax which is approx £32.50 per traveller.